In an increasingly modern and sophisticated era, companies throughout the country continue to innovate to produce new products that are in the public interest. Local companies are trying to produce high-quality products to fight products from other countries. In addition, to sophisticated tools such as computers and gadegt, it turns out cosmetics are a product that has become a basic necessity today, especially for women. The high interest in various beauty products encourages the desire of entrepreneurs to produce the best cosmetic products. And one of them is Russian cosmetic brands. Russian cosmetics brands are growing and many distributors from other countries have marketed them. Like China and Vietnam, which are the biggest consumers of Russian local cosmetic brands. Then, why are Russian cosmetics brands very popular and growing? Russian local cosmetic brands are mostly made from herbal ingredients so that it has a positive impact on the skin and has minimal risk. Different from other cosmetic brands that offer a fast processbut high risks. Russia is very rich in vegetables and plants that are beneficial for beauty. No wonder, if Russian women are more beautiful and have healthy skin. They are naturally beautiful and Russian women are very famous for their beauty. However, their beauty was even more radiant even though they were no longer young because they took care of local cosmetics brands that were very useful. Do you want to have beautiful skin and appearance like a Russian woman? In this article, we will provide a number of local Russian cosmetics brands that prove to be good and safe that you can try. Here are 5 best local cosmetics brands from Russia. 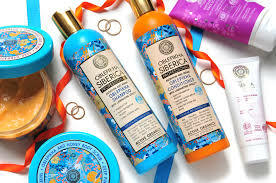 Natura Siberica is the best-known and best Russian cosmetics brand that has spread to almost all over the world. if you are a herbal cosmetic lover, of course you have heard the name Natura Siberica or even you have used it. This local Russian brand is based in Moscow, Russia. This brand was discovered by Andrei Turbnikov in 2008. In 2017, Natura Siberica has opened 70 own shops and sold their products in more than 40 countries. Very rapid development even though it only emerged in 2008. Cosmetic products from this brand are loved because they are made from herbal ingredients such as vegetables and medicinal plants that grow in one of the least polluted areas in the world, Siberia. In accordance with this brand name, Natura Siberica. Herbal plants from Siberia have high antioxidants that are used for skin and hair care. For skin care, some products from Natura Siberica include body butter, face mask, sauna and SPA, body scrub, and hand lotion. For hair care products such as shampoos, conditioners, oil complexes, and treatments for growing male special beards, Natura Siberica Fury Of The Tiger. Not only that, there are still many Natura Siberica products specifically for men such as anti-dandruff shampoo and shower gel made from wild taiga herbs from Siberia. Products offered by this Russian local brand will make you more beautiful, clean and healthy. Because their products use herbal ingredients from Siberia and you will not be allergic. The manufacturing process also uses high technology. If you are interested, there are lots of Natura Siberica stores in Moscow and major Russian cities. and maybe also in your country. but be careful with fake items. Besides Natura Siberica, Russia’s best cosmetic brand which is also very well known is Love 2 Mix Organic. This local cosmetic brand also uses natural ingredients for your skin and hair care. For hair care, this brand releases hair mask, balm and shampoo products, and for skin care this brand releases products such as bath gels, body oils, creams, souffles, and others. The ingredients used are natural ingredients that have been proven safe and of high quality. Such lemongrass is combined with pears, cucumbers and mint, watermelon and eucalyptus, berries, papaya and butter, mangoes, and oranges. The price of Love 2 Mix Organic is also affordable and you can easily get it. Guaranteed, you will enjoy the sensation of care from this local Russian brand. Teana is a local Russian cosmetics brand located in the science city of Jubelein and on the coast of Brittany, France. Cosmetic products from Teana have gone through laboratory tests and have secured certificates. In addition, the products that are proven effective for skin care, Teana cosmetic products are also very fragrant. The products include serum, hand cream, face and neck cream, and peeling gel. Teana produces products for normal skin, dry skin, and oily skin. So, you can adjust to your skin problems. Hand cream Teana with shea butter is priced at $ 17.9. And other products are also sold at affordable prices. Teana is one of Russia’s best local cosmetic brands. Black Pearl is one of the best local cosmetics brands specifically for skin care. This brand also uses natural ingredients like most other Russian cosmetic brands. This brand releases products such as BB cream, Makeup Remover Gel, and anti-aging cream. Black Pearl had received a gold medal for the best series at the Intercharm international exhibition. This local brand was founded in 2002 and became the first to get the certificate of ICEA organic natural cosmetics. All of these brand products use organic oils and herbs. The most popular products are bath soaps for the body and hair. Bath soap is packaged in jars at a price of 300-400 rubles. With a jar, this bath soap can be consumed 2-3 months. The smell of bath soap is also very fragrant and flowery. Besides bath soap, another popular product is body scrub. The body scrub collection from Babushka Agaphya’s Recipes has 5 types, 3 large and 2 small. Body scrub contains scrubs that are able to rub the skin well and remove dead skin cells. However, you must hold a fairly rough scrub, made of pine. However, it will not hurt your skin. If you want to treat yourself totally without endangering your body, the 5 Russian local cosmetic brands above can be your choice. Russian local brands are very popular because they use safe herbal ingredients. Besides that, the cosmetic brand above also has an affordable price but still safe to use. Those are 5 Best local cosmetics brand from Russia. If you want to have beauty like Russian women, you can try the 5 brands above. Not only for women, for those of you men who want to look perfect, products from Natura Siberica can be the right choice for you. Happy trying everyone!